Love our Kampa Easytread groundsheet carpet! Adds luxury to outdoor living. Warm and nice underfoot - perfect size for our matching awning. Eco friendly, attractive and easy to use. Bought this to go to Burghley Horse trials as a group of us kipping in my friends caravan awning, excellent rained really heavy one night and damp did not some through, we wrapped it up and took it to the cross country to use as a picnic blanket - very versatile bit of kit and keep the bag to carry it around! 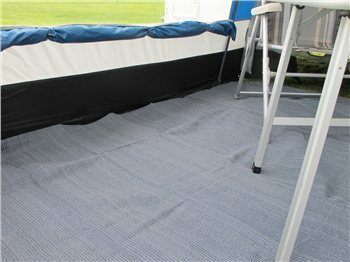 This is the second Kampa easy tread Carpet we have bought (for different tents) and it seems as comfortable, hard wearing and easy to clean as the first. Good stuff! A good quality groundsheet. Exactly the right size for my needs. Used once and very pleased. Looks like it should wear well. Excellent price and very prompt delivery.